Cooper The Survivor (I Hope): He Was Broken? 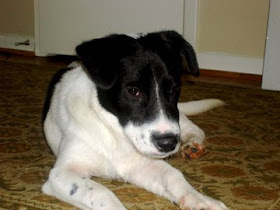 The reason for this blog is mostly for my own personal venting about the sad situation surrounding my new puppy, Cooper. I adopted him from BARC, but he has distemper. Its been a while, so the short of it is that Cooper is now 'fixed'. The vet and I decided he was healthy enough. He is now home, and seems to be totally fine. As to the vaccinations.... we have still only had the rabies booster. I am too nervous about giving him the distemper vaccine until maybe January. Ideally I'd like him to be clear of the distemper on his next PCR test, which we'll do in December I guess. In the meantime, Dr. Shows is trying to locate a solitary Parvo vaccine. The issue is that in modern times, most of the vaccines are combined into one serum, and my vet doesn't carry the vaccines separated. Oh, he's also grown a ton. Well, it feels like a ton. He is at 39 pounds now! How that happened, I don't know, but it seemed like it was overnight! Behavior. Oh the behavior! In general he is quite well behaved. Unfortunately he has shown some signs of either aggressiveness or eagerness on the leash when other dogs are around. I could really use some advise on this. My vet thinks it might just be me... as in he's feeling protective. Well, its something we are working on. The rest of his training is going well. He is great when we do beginning commands like sit, stay, and come. I'm hoping the leash barking will get better as the training continues. Out of necessity because of the virus, he's also led a pretty sheltered life since I got him too. That can't help. He did meet and play with my dad's dog Sherlock last week. That went well.